LIP INK® Tinted Lip Shine Moisturizers including, LipMax 3D Lip Volumizer, Glitter, Color & Flavors contains age-fighting anti-oxidants, vitamins and moisturizers that hydrate, soothe and condition your lips. Natural light reflectors ease the signs of sun damage. Applying LIP INK® Tinted Shine Lip Moisturizer on top creates a moist silky feeling with added shimmer. A more generous application transforms a matte finish into a high gloss shine. Always begin by purifying the lips with LIP-INK Off Conditioning Remover then splash with water and pat dry. This not only cleanses but helps with the exfoliation process. 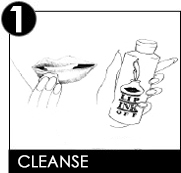 Massage a small amount into the lips until thoroughly absorbed. Apply just by itself, or in layers. Once you are finished, you have the choice to layer a color of LIP INK® Liquid Lip Color. Finish with a final layer of LIP INK® Tinted Shine Lip Moisturizer. Then use as needed throughout the day. Not Compatible with other cosmetics. Methoxycinnamate. Panthenol. Octyl Salicylate. Tocopherol Linoleate. Tocopherol. Ascorbyl Palmitate.